Built in 1842, situated between Singleton and Muswellbrook. Four members of the Nowland family were amongst the earliest white settlers in the Upper Hunter area. The three brothers - William, Henry and Edward - went there in the early 1830’s - nearly 170 years ago - and their sister Mary in the 1840’s. They had been living in the Wilberforce area, prior to moving north with their spouses, offspring and hopes. All three brothers had married Farlow girls, who were the children of Robert and Ann Farlow. The parents of our Nowlands had been the convicts Michael Nowland (c. 1760 - 1828) and Elizabeth Richards (c. 1769 - 1852), and they had met on Norfolk Island, after having arrived in the colony on the Second Fleet, on the “Scarborough” and “Lady Juliana” respectively. Henry Nowland initially received land grants in the 1820’s near Singleton, where Camberwell and Hambledon Hill are today, but sold them for land around Liddell, Muswellbrook, the Liverpool Plains and Merriwa. He owned the properties of "Callatoota" (then 2,000 acres) and Overton (then 4,000 acres), and by the 1850’s he owned 2/3 of the allotments in the the growing town of Muswellbrook. This included most of the land on the western side of Bridge Street, and he established a hotel there called The Royal. This was where the National Australia Bank is today, and he lived there with his wife Harriet, and growing family. 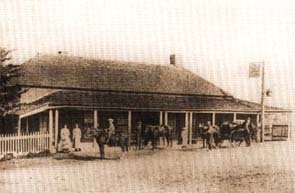 Earlier, in the early 1830’s, he owned a hotel where today’s Royal Hotel is located, and was then the town’s first resident. He established a blacksmithing and coach-building business in Hunter Terrace, where Brighton Villa is, and built the Chain of Ponds Inn on land of 150 acres he had owned at Liddell, in the vicinity of todays Liddell and Bayswater Power Stations. The work for the hotel building was carried out by his assigned convict labour in 1842, and has unfortunately been allowed to disintegrate in recent times, under State government ownership. It was known as “The Halfway House” when I was a child, and it proudly stood half-way between Muswellbrook and Singleton, on what was then the New England Highway. 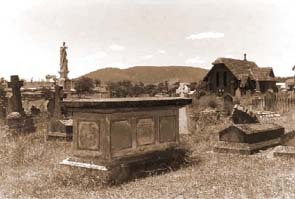 cemetary grounds, which was demolished a few years later. 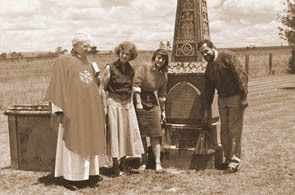 on the grave of William Nowland, 18th of Nov, 1990. Norma Waterhouse, Liz Kirkby (Parkinson) and Ken Kirkby. a few kilometres North of Singleton. His coaches and mail delivery runs predated Cobb and Co, who took over his runs and bought his coaches after his death in 1863. He is buried in the Muswellbrook cemetery. 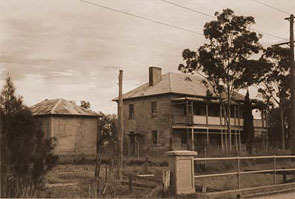 William Nowland took up the grants initially made out to his brothers in the Camberwell area, and established his property called “Rosedale” there. It comprised fifteen hundred acres, and it was then known as Falbrook. He established a hotel there too - the Queen Victoria Inn - and had brother-in-law Alexander Johnston run it during his absences. He then took up land over the ranges and had to find a route to get there. He is the best known of the Nowland Brothers, as he discovered a pass over the Liverpool Ranges, north of Murrurundi in 1827, along the route which is used today. It took him 6 months to do this as he’d had to hide from marauding Aboriginals, escaped convicts (turned bushrangers), and battle the elements. He took a dray and cattle across, with the help of his convict stockmen, and the route is signposted as Nowland’s Pass today. His property was “Warrah” and it was unfairly taken by the AA Company in 1832, and he then established “Wallala” near Breeza and Wards Mistake, near Glen Innes. All his life he was troubled by corrupt Land Commissioners, cattle poachers, and dishonest neighbours. He died in 1884, and is buried at St Clements, Camberwell. Edward Nowland was employed by the Hawkesbury Benevolent Society to run their cattle on property they had north of Quirindi at Breeza. In the early 1830’s the ever-powerful AA Company also threw them off their land, and gave them lesser quality land at Mooki as compensation. The letters Edward wrote to the HBS show that his life there was very hard, and plagued with continual problems. These included droughts, trespassing cattle, threats from bushrangers and low pay. He died in 1842, and his brother William took over his job, in addition to running his own properties and herds in the area. Mary Nowland married Alexander Johnston, and their family were amongst the first residents of Scone. He had been sent to Australia for treason in 1820, for his part in an uprising in Scotland, which opposed the British. 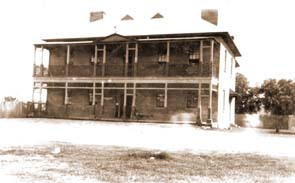 Initially the Johnstons ran William’s hotel at Camberwell (as above), and were temporarily in Muswellbrook running a hotel after that. But in 1848 they moved to Scone to run a hotel there called “The St Aubins Arms”. This is on land which had once been part of William Dumaresq’s St Aubins, where the property had once totaled over 13,000 acres. The Johnstons re-named the hotel “The Woolpack” and they ran it for the next 20 years under this name, before it reverted to being a private home. It still stands today, on the New England highway, on the southern side of town. However in the 1840’s and 50’s, it was a coach-stop along the Nowland route, which extended almost to the Qld border.